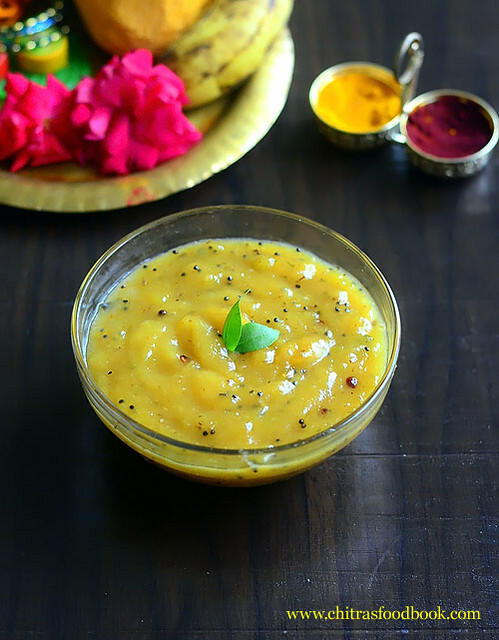 Mango Pachadi / Manga pachadi in Tamil and Arisi paruppu Payasam/Rice moong dal payasam is a must & should neivedyam(Prashad) recipe for Tamil new year(Puthandu) in Tamil nadu. But people make it with their own variations. Some people make this sweet mango pachadi adding sugar. Some make it with ripe mango too. But we make it with raw mango adding jaggery, coconut paste and neem flower ( Veppam poo). This pachadi has to be prepared with 6 different taste ( sweet, sour, spicy, tangy, bitter, salt) to denote that all the emotions of a person has to be treated equally. Tamil Brahmins make it almost the same way but without coconut. Basically I am a big fan of raw mango recipes. This mangai pachadi is even more special as I make it only once in a year and that too on Tamil new year day. I love this combination of sweet and spicy taste more than Sendhil & Raksha. 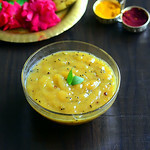 Today I have shared our style of making raw mango pachadi with step by step pictures and a video. I have also mentioned the points for variations. Do try it for this Tamil new year celebration and offer God ! Check out my Tamil new year lunch menu post for more neivedyam recipes we prepare on this day. Wash and peel the skin of raw mango.Slice it roughly into big pieces. Set aside. In a mixie jar, take the grated coconut and add required water. Grind to smooth paste. Keep aside. In a kadai or deep bowl, add 2 cups of water and let it roll boil. Add the mango slices, finely chopped green chillies, salt and cover cook till it turns soft and cooked. 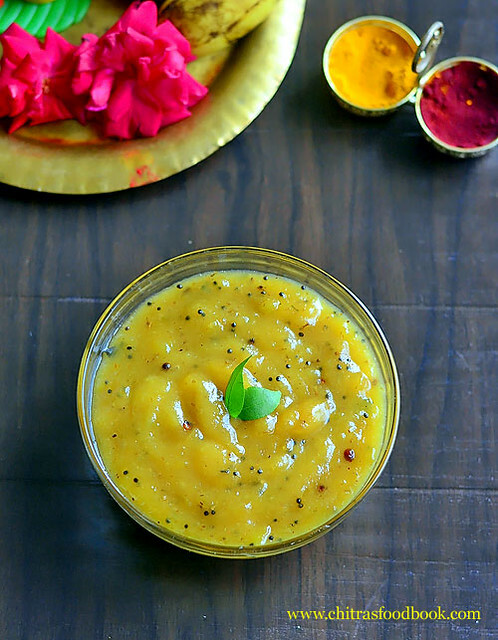 ( If the mango is too sour, you may need to add more jaggery for this pachadi. To avoid this, drain the cooked water to remove sourness and then proceed if you wish) My mango was not too sour.So I din’t drain the water. After the mango is cooked well and soft, mash it roughly with a ladle. Add the grated jaggery ( If the jaggery has impurities, melt it by adding 1/4 cup water and filter it.Add jaggery syrup to the cooked mango).Add little water to melt the jaggery if needed. Mix well and boil till jaggery melts and raw smell goes off. Now add the coconut paste, mix well till it becomes semi solid in consistency. Switch off the flame and remove the kadai. Heat a small kadai and dry roast the neem flower till it turns golden brown and crispy. Remove in a plate and crush it well. Heat oil in the same kadai and splutter mustard seeds, urad dal, red chill, hing and curry leaves. Add the seasoning and crushed neem flower to the mango pachadi. Mix well. Offer God and get his blessings ! Adjust the quantity of jaggery based on the sourness of raw mango. If the jaggery has impurities, melt it by adding 1/4 cup water and filter it.Add jaggery syrup to the cooked mango. You may have to add more jaggery if the mango is too sour. To avoid this, drain the excess cooked water and then add jaggery. We add Neem flower only for Tamil new year otherwise it is not needed. If you don’t get fresh Neem flower, you can use dried ones. 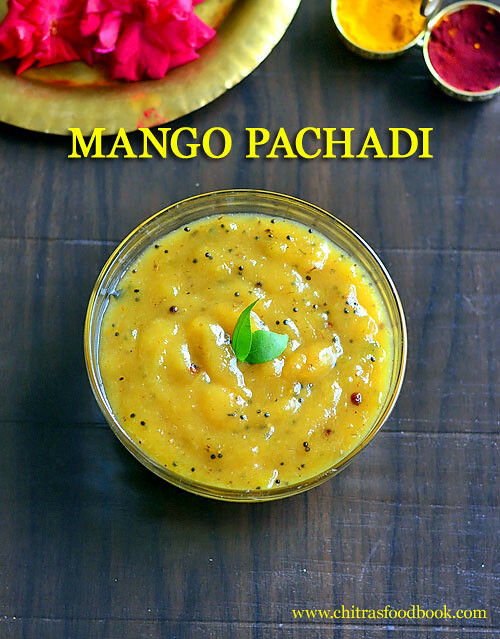 Try this sweet mango pachadi for this new year and have a great celebration !